This is the final installment of a 3 part series on how to build and maintain a small scale SPS propagation system. If you haven’t read the other two, you may want to start by taking a look at Part I (link) and then Part II (link) to fully understand what is going on in this little system. While it is not required reading, it is helpful background information and you may find it useful if you’re interested in starting a little frag system or even a larger scale propagation system yourself. The present article is based on the day-to-day husbandry, observation and hard-learned lessons of developing our small propagation SPS system. In some cases dumb luck proved to be the greatest teacher. While some people say I have a wet thumb, I am convinced that it is a consistent approach to system stability that has brought this prop system to the state that it is in today. I have spent many years watching SPS experts grow rare and exotic corals, and I’ve made a mental catalogue of what they are doing to get them to be as beautiful as they are. To me they are best practices and I try to incorporate them whenever I can. This system is somewhat peculiar since atypically the frag trough is plumbed directly into my 150g display tank. The propagation system is 6’ long and roughly 75 gallons. 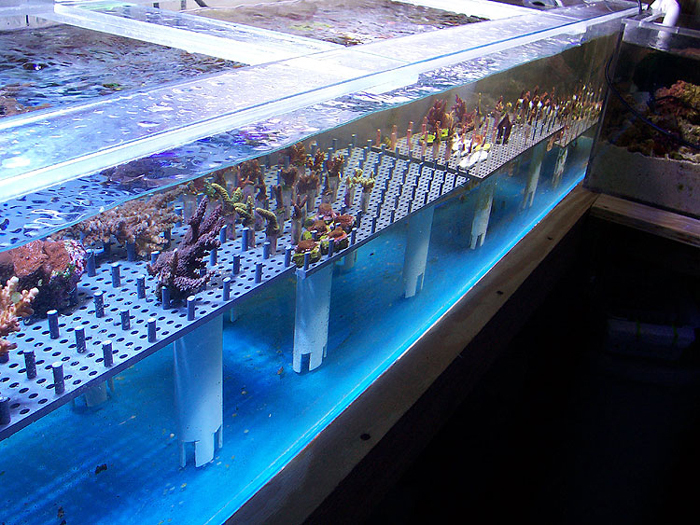 It houses a rack system designed to put corals in close proximity to each other on ¼” pvc rods. 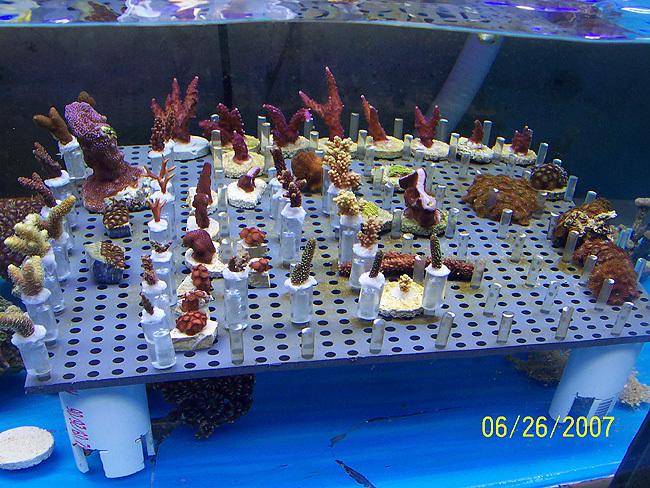 Each coral is glued onto a ½” PVC rod that is counter-drilled ¼” and placed on the rack with all the ¼” pegs. The rack body is constructed from ¼” perforated PVC where the ¼” rods are inserted into the perforations. 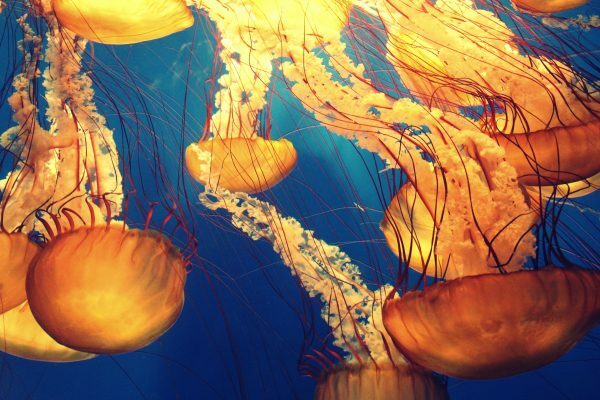 This system is the brainchild of Tristan Wilson, former aquaculturist at Atlantis Marine World in Riverhead Long Island; he and I worked this system out on a car ride to see Sanjay Joshi’s tank at Penn State University. I thought it was a well conceived system as it was able to put anywhere between 600-1000 frags of SPS, LPS and zoos into a compact 72”x16”x18” space. Lee Goldman made an interesting presentation at the Houston MACNA (2007) on Scleractinians and establishing competitive growth environments in aquaculture facilities. I was quite surprised and intrigued by two things in particular – first, was that I was already practicing what he studied over the course of months – secondly, he used a picture of my display tank from 2006 (I must have been doing something right). The former, however, is where the importance for this article lies. 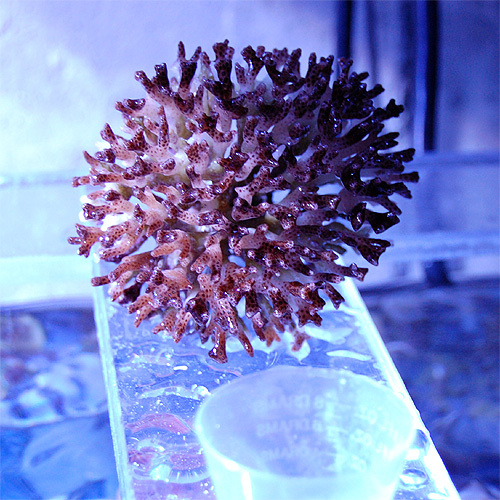 He proved that certain coral species grow quicker when they have to compete for growth area in a captive environment. His focus was on radial growth based on proximity to a competitor. 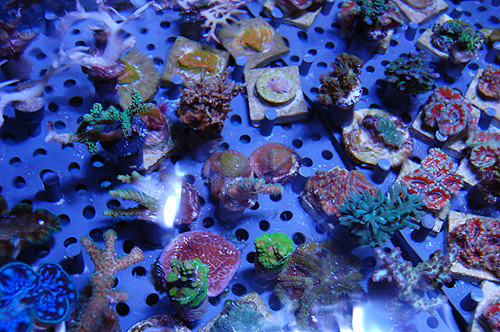 His experiments can be read about in detail in this Advanced Aquarist article. When standing in line at the dinner keynote address, I starting talking with Lee and I explained to him that some of my corals were growing bushy (meaning in a baseball like shape) – and some were even tabling – we hypothesized that the water height – meaning, the amount of water above the colony to the outside air – affects the shaping of the overall coral colony as well. That, in conjunction with tight space in my system basically forced corals to grow more colony-like – instead of shooting corallites up and out, they branch closely to each other creating nest-like colonies. 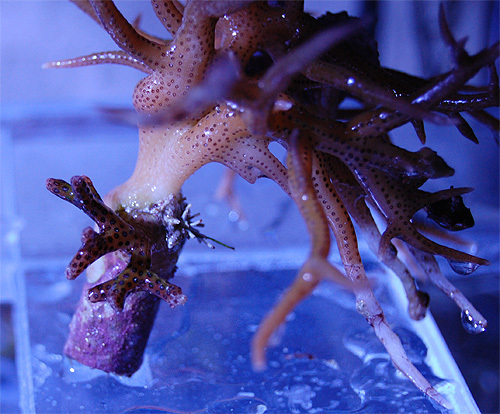 You can see this in the cases of Poccillipora (they usually grow like this anyway) but more importantly in this colony pictured below. The animal choices on this system are not nearly as deliberate as Dr. Goldman’s studies. I can tell you, though, that all the SPS that I have put in close proximity of each other grow out of control. I’d like to attribute this to me, but nature is just doing its thing and letting the corals out-compete for the space. Clearly this works as noted in the scientific experiments, but it also works in practice. 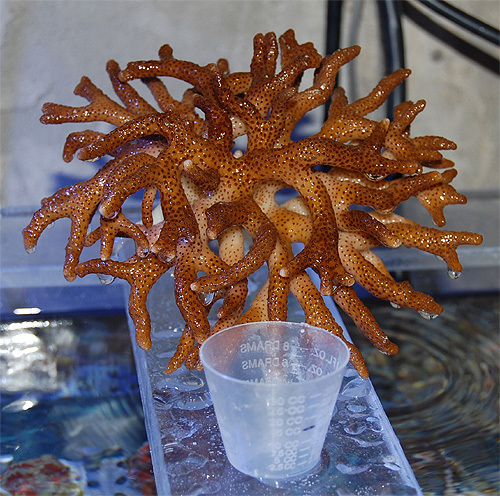 At any given time, there are 50 distinct and unique species in this system, including: Acropora, Seriatapora, Poccillipora, Montipora, Stylophora, Zoanthids, and Acanthastrea. As you can see from this photo, we were even getting spawning events as the tri-color Poccillipora attached to the plug of the birdsnest. This is not a rare event for this system as many of them have appeared in both the display as well as the trough. Most who know us know that we run a calcium reactor on this system with weekly dosing of ESV B-Ionic 2 part system. These are the two items that keep my reef stable and growing out of control. These are the items that also keep my parameters stable each week. Aside from that, I add a squirt or two of strontium chloride and every other week, as well as some Lugols Iodine. 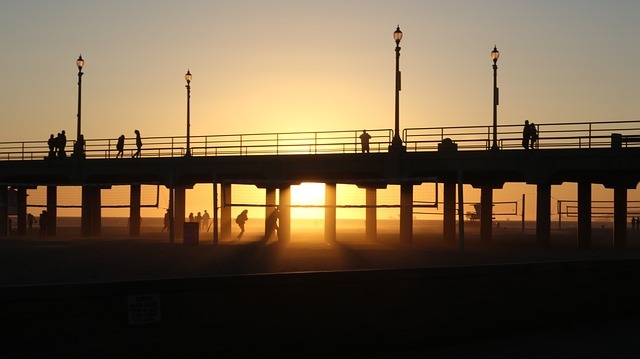 Temperature 79 degrees – gets as high as 83 in the summer time. Additionally, nothing goes in without an aggressive treatment of Interceptor as well as Tropic Marin Coral Procure at 10x recommended strength. 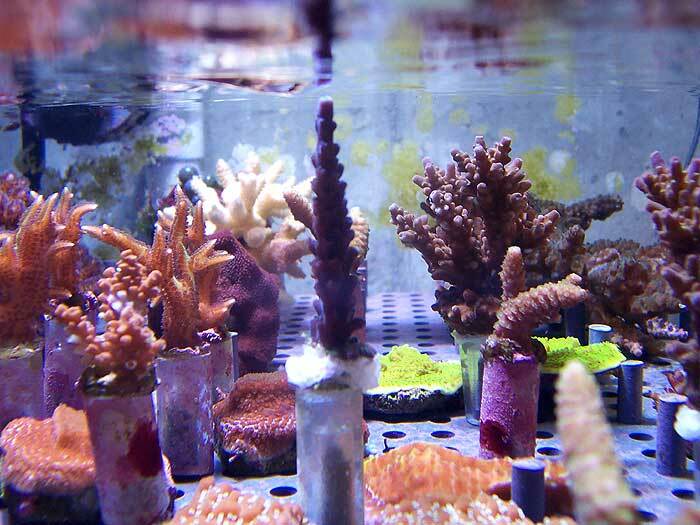 The unfortunate by-product of this aggressive treatment is occasional “browned out corals” and sometimes dead corals – all necessary in order to keep the system pristine and bug free. In addition to aggressive treatments on the way in, I treat with Interceptor as a prophylactic – one of the reasons why I can’t keep cleaner shrimp in my display. In closing, I have to say that it’s bitter sweet to be ending this three part article. I hope those who took the time to read all three enjoyed the series and were assisted by the information. We will continue to document this system, grow out corals that might otherwise be ripped from the ocean’s reefs and do what we committed ourselves to do when starting Manhattan Reefs – propagate, trade, sell, swap as many corals as possible in order to help preserve one of nature’s most fragile environments. I hope other hobbyists consider the impact they can have by doing the same. Special thank to Lee Goldman for listening to me at MACNA.